Kurt and I don't often go on official dates, so we decided to give the whole dinner and movie thing a try. (We realized we had never even been to a movie by ourselves before!) 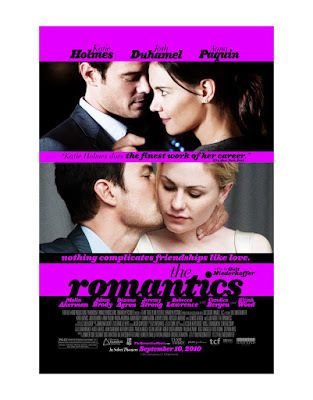 My choice was The Romantics. (One of the blogs I read had featured the cast and a shoot they did with J. Crew and it looked interesting.) Kurt was skeptical and convinced I was dragging him to some dumb romantic comedy but eventually conceded to my wishes. We walked to this cute, old theater in Cobble Hill--a nearby neighborhood in Brooklyn. I frantically rushed us along to make it to a 7:45 showing. The movie had only been in theaters a week and I was afraid it would be sold out. We made it there by 7:30 and were the only people in the entire theater. Three or four couples showed up in total. Whoops. The movie was good. To Kurt's delight, it was definitely not a romantic comedy. It was pretty dramatic at times--centering around a love triangle (if you already couldn't tell from the movie poster) within a group of college friends. But parts of it were also really funny. There are some hilarious wedding scenes--one of my favorite being the toasts at the rehearsal dinner. The ending was not your typical feel good conclusion and sort of open ended but very fitting to the movie. I thoroughly enjoyed it. You should see it! After dinner, Kurt and I randomly stopped into a Thai restaurant near the theater and shared some fried rice. (I was proud of how spontaneous we were being!) I should have taken a picture because the interior of the restaurant was pretty interesting. After dinner, we even tried out a new (to us) bar along the walk home. Dinner and movie nights are a little pricey to do often but I'm hoping we can incorporate it into our normal weekend activities. It's starting to get chilly so some nice indoor entertainment is very welcome!